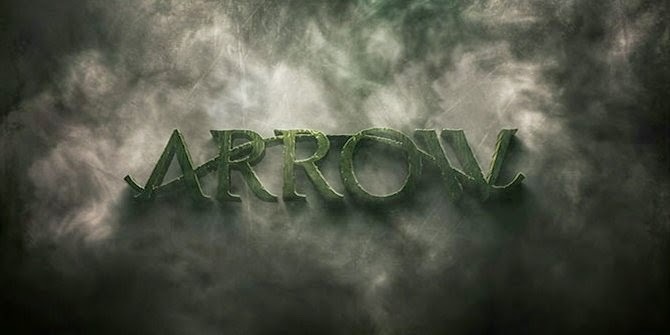 WELCOME TO HELL ~ by Glenn Walker: Arrow S03 E10: "Left Behind"
Yes, the Arrow is dead, and while this is new for television, in the comics, Green Arrow has been dead before. More than once. He's always gotten better. And seeing how Stephen Amell and his bare chest are the stars of this show, he won't be dead for long on TV either. Here's the situation, quick and mostly painless, as I'll be glossing over the weak plot points and cliches as we go. While under Malcolm's mind control, Thea killed Sara. To keep the League of Assassins from killing Thea, Oliver takes the blame and is brought before R'as Al Ghul. In lieu of execution, Oliver challenges R'as to a duel, a trial by combat. It's a good fight for a moment or two until R'as stops toying with Oliver, puts his sword through his chest, and kicks him off a cliff. Yeah, baby, dead us dead. Or is it? Meanwhile as we open on a chase scene in Starling City, Team Arrow is making the best of it without their leader. Diggle is in the Arrow suit (no mask) and Arsenal is taking point. I love the one bad guy's reaction to the young man in red, "I thought he was supposed to be green," and at Dig's bad aim, "I thought he was supposed to be good." Felicity is the only one of the three who believes Oliver is still alive. The bad news is that this Arrow-less Team Arrow is going up against Brick. 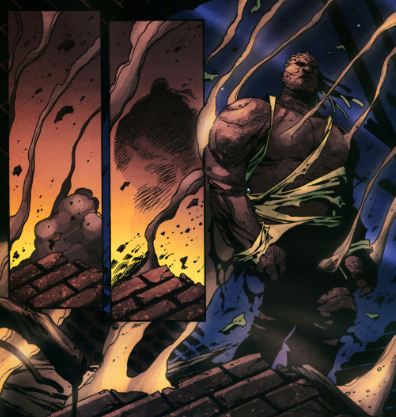 Brick is a 21st century Green Arrow foe from the comics. Danny Brickwell was a low level thug and enforcer who rose to crime lord status with his powers of super-strength and invulnerability. 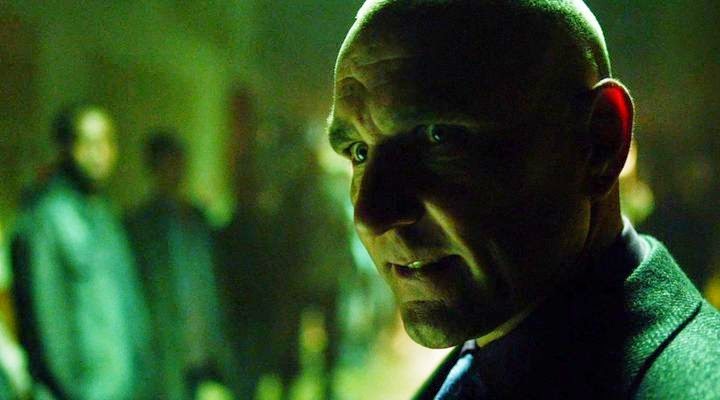 Played here by charismatic but typecast villain actor Vinnie Jones, Brick might not be a metahuman (jury is still out on that, did he take a bullet to the head? ), but he's strong, resilient, and very intimidating. And he's killing or threatening witnesses, and stealing evidence from the police, giving him a sort of invulnerability. The case against Brick is made even more difficult by a couple visits by Malcolm Merlyn to the Arrowcave (they gotta change the locks). He first suggests, then brings proof that Oliver is dead, finally shaking Felicity's faith. 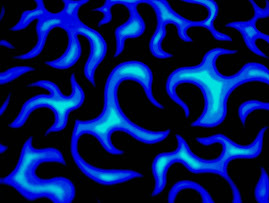 Not just shaken, broken. Felicity is of course playing double duty super-assistant to Ray Palmer as well. She brings her poopie party to that job as well and tries to shatter Ray's confidence, not maliciously, but possibly effectively. Things do not go well. 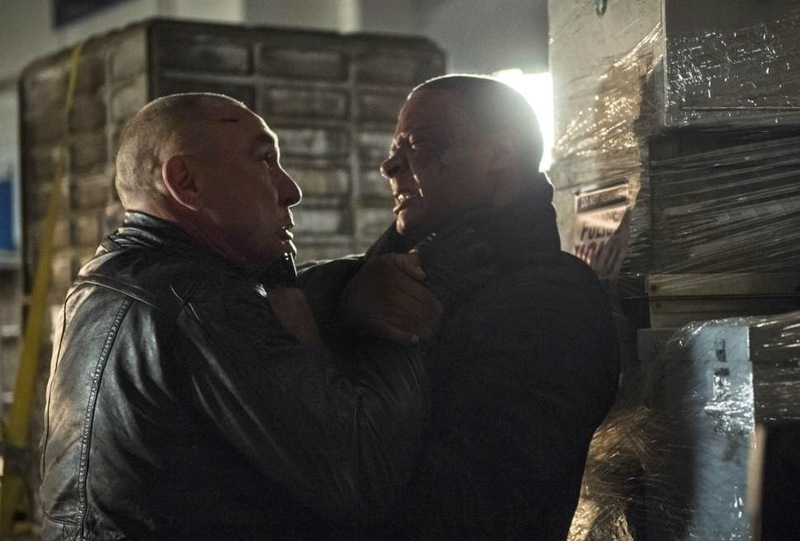 It was nice to Diggle go one on one with Brick, but hated to see him lose. Felicity loses her cool and second guesses herself, opting for the safety of the team over catching the bad guys. Brick now has a force of men to take over the Glades. This is not the ending any of us hoped for. Team Arrow in shambles and everyone they've caught since Deathstroke is now back on the street and under Brick's thumb. The story in Flashback Hong Kong continues as Amanda Waller insists Oliver and Maseo go after China White and the bomb components as opposed to Tatsu/Katana. Of course it perhaps only serves to keep Stephen Amell on the screen in his own show that he's the star of. There may of course be a payoff in the flashback story this episode however. We knew from advance press and Amell's own words that Oliver would not be resurrected via Lazarus Pit, which of course would be the first option when a character dies in a R'as Al Ghul story. So something else would have to happen. We had seen Tatsu's healing abilities earlier in the season, and as Oliver helped Maseo find her in Hong Kong - he is owed a debt. The debt is paid when we find that Maseo has stolen Oliver's body and Tatsu has revived him. And then there's the new Black Canary. I guess we have to take what we get. I have never liked the casting of Katie Cassidy, and I like my Black Canaries curvy and in fishnets as opposed to lean and leathered. And the wig is so obviously a wig - I hate it - did she rob China White's closet? Perhaps I'm being too rash from a brief cameo, but we'll see. Time will tell. Next: More of the new Black Canary, and the return of the Arrow in "Midnight City." You can read all of my "Arrow" reviews here, and my Biff Bam Pop! reviews of "The Flash" here.